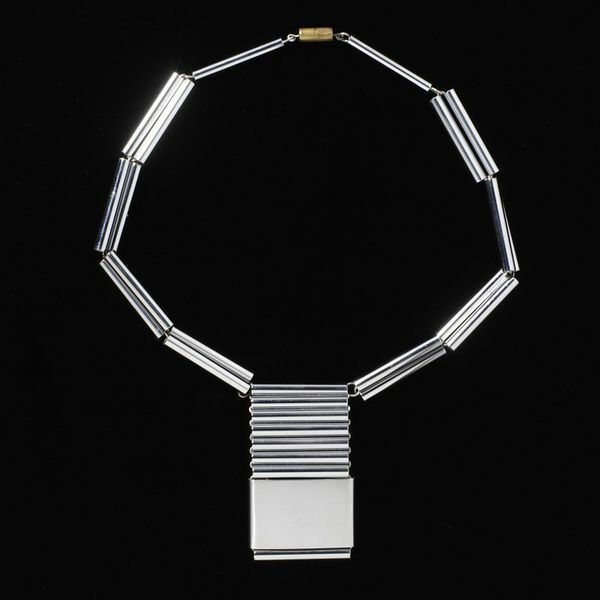 Naum Slutzky had a distinguished career as an inspirational teacher, both in Germany and in England as well as the distinction of being one of the most original jewellers to be associated with the Bauhaus. His jewellery designs are characterised by a simple, elemental elegance where the geometric construction is pared down to the irreducible minimum. Even such features as the clasp on a bracelet have an engineered simplicity which was typical of Slutzky’s approach to his metalwork designs. Naum Slutzky, born in Kiev in 1894, the son of the goldsmith Gilel Slutzky, emigrated to Vienna in 1905 where he first trained as a jeweller under Anton Diamant. From 1908 to 1912, he was a student of goldsmithing under Cheine Litweie. He briefly worked for the Wiener Werkstätte between 1912-13 before undertaking engineering studies (1914-19) at the Technical High School along with formal artistic training at the Viennese Art School. In December 1919, Slutzky was invited by Walter Gropius to be an assistant in the metal and goldsmithing workshops of the Weimar Bauhaus, working with Christian Dell and Laslo Moholy-Nagy. By 1922, he had risen to be a master goldsmith but by 1924, he had left and for the next three years, split his time evenly between Vienna and Berlin. Between 1927 and 1933, he practised as an interior designer, lighting consultant and goldsmith for the retailer, Kaufmann of Hamburg. It was during this period in Hamburg that Slutzky began to be included in a number of important exhibitions. In March, 1928, he contributed a number of drawings and lighting designs to the Hamburg Secession exhibition; in the Hamburg Neue Secession exhibition of April, 1930, held in the Hamburg Kunsthalle, Slutzky contributed lamps and jewellery. He is also recorded as a exhibitor in the Deutsche Werkbund exhibition, held at the Societé des Artistes Décorateurs in Paris that same year and at the Hamburg Secession exhibition, held at the Kunstverein (March – April, 1931) his work was represented by a series of watercolours, drawings, metalwork and jewellery. It was during this period in the late 1920s that he met and became friendly with Gesche Ochs who was to become an important patron. Some examples of Slutzky jewellery and a teapot held in the collections of the Victoria and Albert Museum were all acquired from Gesche Ochs in 1967. Forced to flee to Britain from Germany in 1933, he first started working as a designer for the well established Birmingham lighting firm, Best and Lloyd but by the following year, he was a employed as an art teacher at the progressive school, Dartington Hall, in Totnes, Devon where he remained until 1940. After the war, from 1946-50, he was a tutor in jewellery design at the London, Central School of Arts and Crafts and from 1950-57, he was a lecturer in Product Design in the Department of Industrial Design at the Royal College of Art. He spent the final years of his career as Senior Lecturer in Product Design at the Birmingham School of Arts and Crafts (1957-64) and Professor of Industrial Design at Ravensbourne College of Art, Bromley (1965). He died on the 4th of November, 1965. Necklace with pendant, chromium plated brass. Made from pieces of round section tubing linked together plus one section of flat metal which forms part of the pendant. The neck band consists of sections of tubing linked together in pairs but with one single section on each side of the screw fastener. The pendant is rectangular in shape and made from one flat strip of metal with its ends turned over towards the back and eight sections of tubing all tightly linked together. Chromium plated brass necklace, Germany, Hamburg, 1930, designed and made by Naum Slutzky.